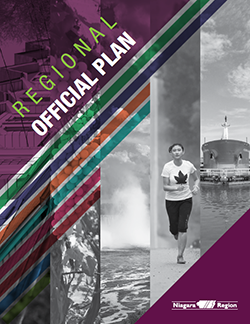 The Regional Official Plan is the long-range, community planning document that is used to guide the physical, economic and social development of Niagara Region. Generally, it contains objectives, policies and mapping that implement the Region's approach to managing growth, growing the economy, protecting the natural environment, resources and agricultural land, and providing infrastructure. Section 26 of the Planning Act requires that Niagara Region update its Official Plan every five years to ensure it aligns with Provincial legislation and interests. The Niagara Region initiated a five year review in 2013, under a campaign titled “Imagine Niagara”. This campaign concluded in 2014 and received the “Communications / Public Education” award by the Ontario Professional Planners Institute (OPPI) in 2015. To request information in a different format, contact us. The Regional Plan is amended from time to time to update policies and mapping, and to facilitate individual development applications. Visit the Regional Official Plan Amendments page to see a list of recent and ongoing amendments to the plan.